This statistic presents a ranking of the most common cyber threat experiences of global internet users. 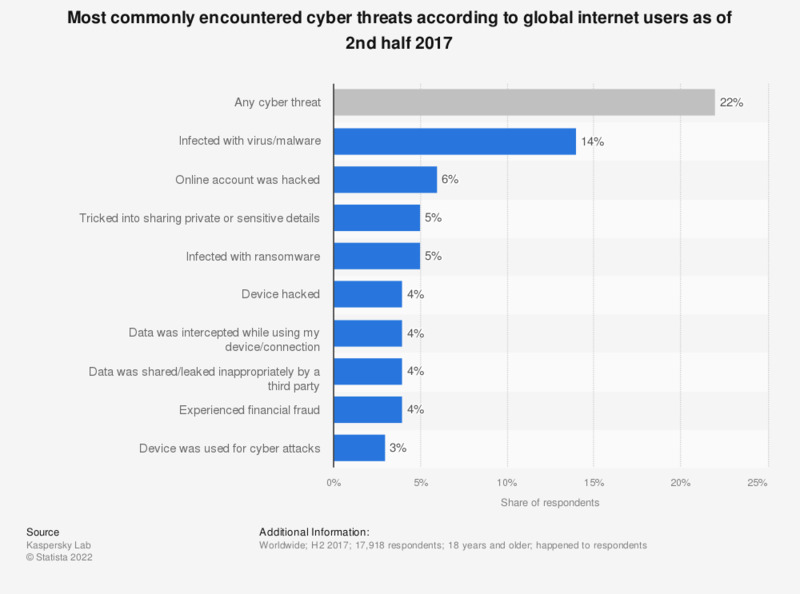 During the second half of 2017, six percent of global internet users stated that they had experienced online account hacking. Virus and malware infection was the most common threat at an 14 percent worldwide encounter rate. Everything On "Internet usage worldwide" in One Document: Edited and Divided into Handy Chapters. Including Detailed References. Statistics on "Internet usage worldwide"
What do you think is your largest online threat? How worried are you that the following will happen to you? How likely is it that businesses like yours will be the target of a cyber attack?